1.) Duration – shown in the x-axis of the waveform is the time property of the waveform. 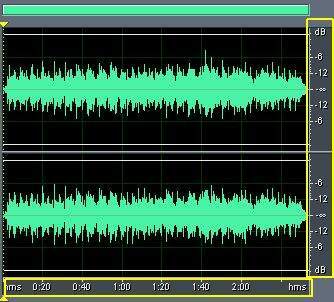 It tells the duration of the audio waveform (e.g. 2 minutes long). 2.) Amplitude – shown in the y-axis is the amplitude property of the waveform. Amplitude in digital audio is scaled in dBFS (logarithmic scale) which tells the loudness or the volume of the waveform at given time. dBFS means decibel “relative to full scale”. 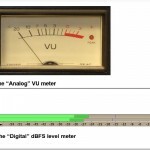 In digital audio, the maximum digital audio level is 0dBFS. Beyond this level, you increase the risk of clipping and distortion in your digital audio signal which will result to undesirable effects in audio quality. The y-axis is scaled from 0dBFS (maximum possible level) all the way down to negative infinity dB (flat line) which signifies complete audio silence. So this implies that -3dBFS is louder than -12dBFS or -12dBFS is louder than -36dBFS. 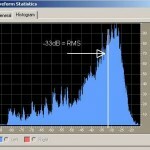 Farther the value of the decibel below 0 dBFS; the lesser will be its resulting loudness. 3.) Number of channels – In the above screenshot, you see two waveforms in the time domain which means there are two channels in the waveform. Two channels mean it is a “stereo” audio waveform. In some waveforms, you can only see one waveform, and it is called a “mono” audio waveform. This is the most commonly used format in recording/tracking (e.g. guitars, vocals, drums, etc.). During audio mixing, you will be summing all mono tracks into a single stereo waveform for mastering. Also in multichannel projects, you will have more than 2 channels and it is called “surround” audio.